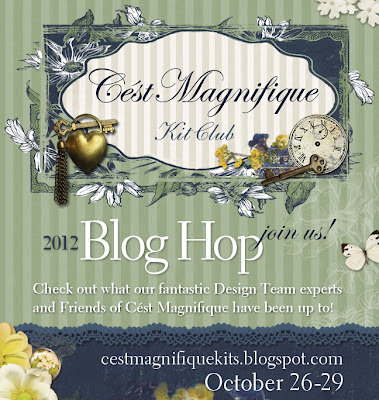 Erin Blegen: My Scrap Cabin: C'est Magnifique Kits November Peek~! Good morning, friends~! It's Thursday morning in my part of the world and I have lots going on in the early part of the day so I thought I'd stop here first and share with you my first project using the November kit from C'est Magnifique! When I look at a picture like this one of my oldest, Wyatt, it's clear that he is growing up! He looks like such a young gentleman and it's hard to believe that just five years ago, he was my first baby. When I went about creating this layout, I wanted the colors to be fresh and young like my photo, yet masculine too. 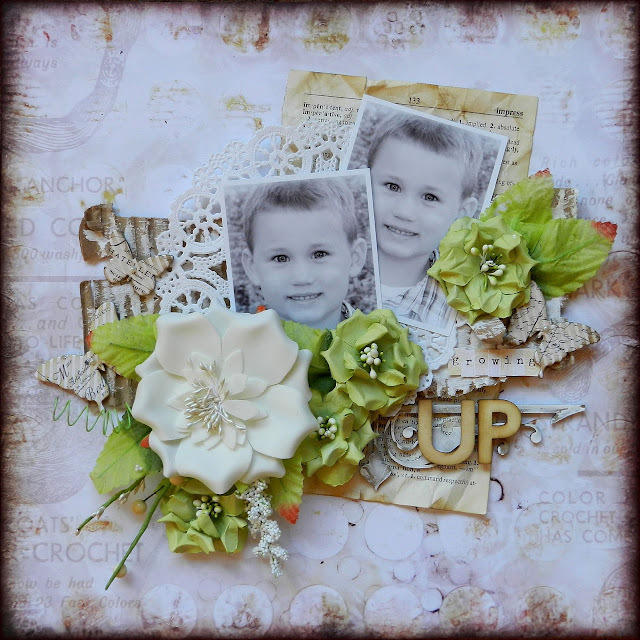 I loved using the Manor House flowers here- the green/white/brown combo is just perfect for a boy page, even if flowers might be considered "feminine". Wow, this is just beautiful! Love the way the flowers just 'pop'! Fabulous layering! En så sød lille femårs dreng kan sagtens tåle at være omgivet af smukke blomster, det er først når de er over 9-10 år man skal være lidt varsom, jeg glemmer næsten helt at fortælle dig, jeg er ret vild med dette LO, du får altid sat de rigtige ting sammen. knus morkaren. I absolutely LOVE how you used that large MH bloom! I have a pink and blue one and haven't been able to make them work, you've inspired me! I just love your work anyway and this is gorgeous!!! Your lay-out is a stunning mix of vintage with a hint of fresh green! Such an amazing lay-out! Love this! The color combination is perfect together. Love those pops of green Erin and I think you use the flowers in a way, that don't come across as feminine on your masculine pages!! And those photos are so sweet! LOVE this page! LOVE the green roses with the white magnolia- such a wonderful combination! Your design is gorgeous and that baby is TOO CUTE! Love the green in this layout. Wyatt looks so grown up. What a cutie!